A great novel about the building of a cathedral. A good plot and wonderful discriptions of the applications of architecture from design to construction in a 13th century background. Gothic revival— also known as Neo-gothic. The design of Gothic revival style architecture was inspired by the medival cathederal. 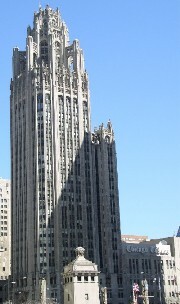 Many skyscapers in the late 1800’s and early 1900’s in Chicago and New York are of this style. Perhaps the most famous being St. Patricks cathederal in New York City. They have windows with distinctive pointed arches; exposed framing timbers, steep, vaulted roofs with cross-gables, towers and verandas, gargoyles and stained glass….. everything you can imagine in ‘spooky’ and ‘The hunchback of Notre Dame’ish feel . 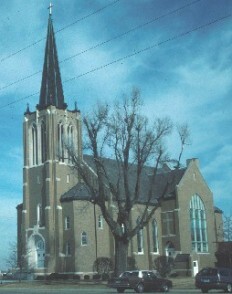 The Victorian Gothic architecture is usually seen as churches, museums, and public buildings. The residential style was, except for the extremely wealthy, a bit more restrained. 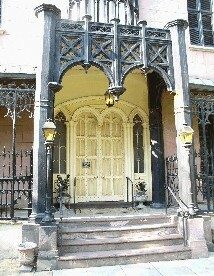 Residential Gothic style architecture was primarily influenced by the architect Andrew Jackson Downing. A self defined reactionary to classicism and romanticism (everything from Georgian style through Greek revival style) his residential designs reflect a complex mixture of symmetry and non-symmetry and ornamental medieval styling. 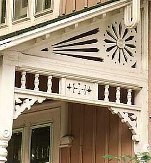 Steam power and the industrial revolution gave builders the ability to add lacy wooden bargeboards and other factory-made ornaments. Modest homes were built of brick with wooden trimwork. The fanciful Gothic Revival style spread across North America via pattern books such as Andrew Jackson Downing's popular Victorian Cottage Residences (1842) and The Architecture of Country Houses (1850). With the wide spread use of pattern books and the creative abilities of carpenters, “Carpenter Gothic” was born. 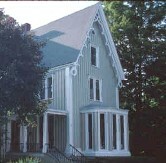 On modest wooden farmhouses, the Gothic revival style was suggested by the shape of the roof and describes a wood frame home with brackets, spindles, and many other ornate wooden detailing on gables, windows, and door trim.